When launched in 2018, the X7 will be the brand's biggest and most luxurious SUV, with a design based on the X7 iPerformance “concept” recently shown at the Frankfurt auto show. TORONTO -- Toronto is the first, and so far only North American stop, for the traveling BMW Luxury Excellence Pavilion, designed to drum up more interest in the brand and its new vehicles. The elaborate “pop-up” store opened in the heart of the city’s financial district, near Bay Street, for its Oct. 16-29 stay. It will host private evening events and open its doors to curious pedestrians during the day. The public can also arrange test drives of various BMW vehicles. The pavilion gets deconstructed after Oct. 29 and shipped to its next global centre. The small store made its debut in Berlin in February and has already visited several countries, such as Italy and Poland. 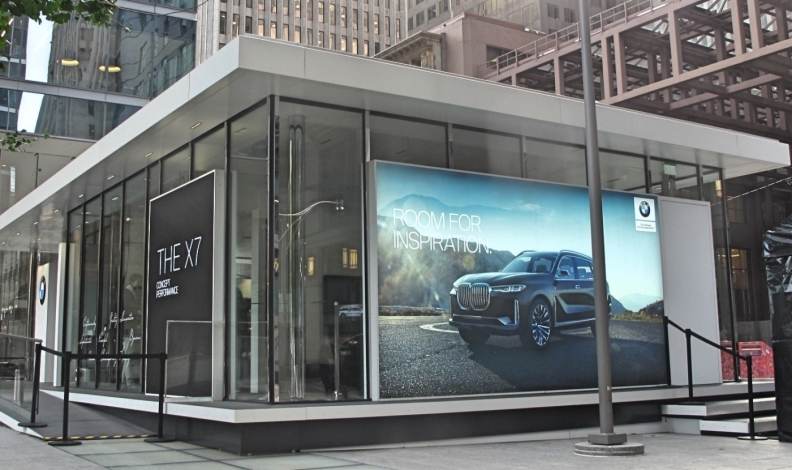 “The team in Munich came up with this idea, to come up with this beautiful space to showcase a vehicle like our X7,” says Sebastian Beuchel, BMW Canada’s director of brand management. When launched in 2018, the X7 will be the brand’s biggest and most luxurious SUV, with a design based on the X7 iPerformance “concept” recently shown at the Frankfurt auto show. The concept made its official North American debut Monday morning at the Toronto pavilion. It will not be around for the full two weeks, nor is it available for test drives. Other “display only” vehicles on site include the all-new M5, the M760, and the 740Le. Beuchel said there is a general tendency for people to not visit retailers as often, because so much vehicle information is available in digital ways, and because they perceive salespeople there will always be at their heels. And in keeping with how luxury brands want to deliver notable “experiences” for their customers, BMW Canada will partner with other non-automotive luxury brands, to co-host interesting events at the pavilion with other upscale brands, such as Isabella Briatico, Montblanc, and Glaschutte Watches. Dealers also like the pavilion idea, says Beuchel. An earlier retailer-only night will be followed by two dealer-hosted nights, where area retailers get to invite their own customers.